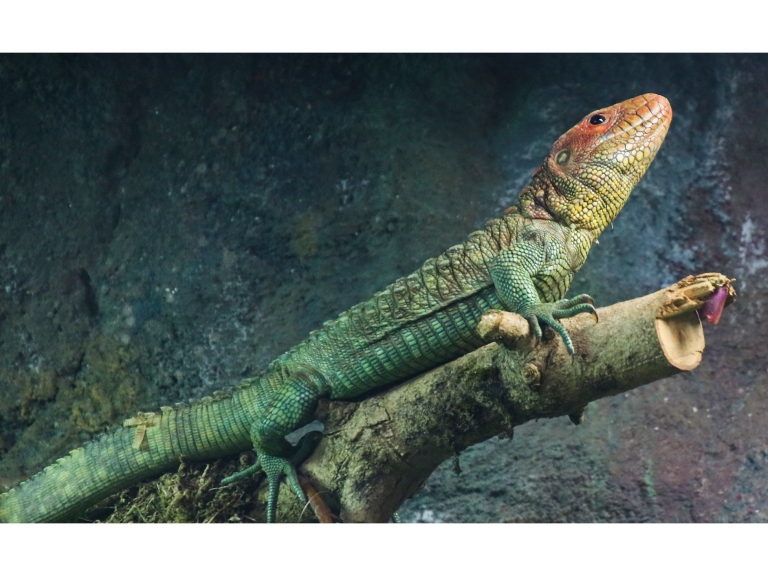 The northern caiman lizard is a new species to Paignton Zoo. With its heavy body, short, powerful limbs and bulky, bright orange head, it’s an intriguing and engaging creature. This striking South American lizard has a long, flattened tail, similar to its namesake, the caiman; in fact, the body is very similar to that of a crocodile. It is typically bright green with darker green bands. The horned scales along the back provide some protection against predators. It’s an animal that’s just full of surprises: it has clear third eyelids that act like a pair of swimming goggles underwater; it’s an excellent climber; its jaws are so strong it can crush snails, crawfish and freshwater clams; it’s intelligent and can solve problems. This photo was taken by Paignton Zoo regular Miriam Haas. The total wild population is unknown and the species has been little studied; zoo staff hope to learn much more about this small but fascinating species over the coming years. The northern caiman lizards at Paignton Zoo can be seen in Reptile Tropics, in a large tank that used to house anacondas.